Valentine's Day is definitely a bit of a Hallmark holiday - but nonetheless we love any opportunity to celebrate. Well, that and we're also suckers for snail mail. Everyone has their own Valentine's Day traditions - whether it's a box of chocolates, a bottle of wine or (as it is for me) an at-home steak dinner with my family of 4. But this February, we're bringing around a new tradition. Valentine's Day is about feelin' the love - and so we've crafted a list that will help you feel just that. Be sure to snag your Free Printable and join along in the fun on our Facebook Group. Each day, we'll be tasked with an itty-bitty challenge. Something that is easy to fit in, but will give us all the good feelings. 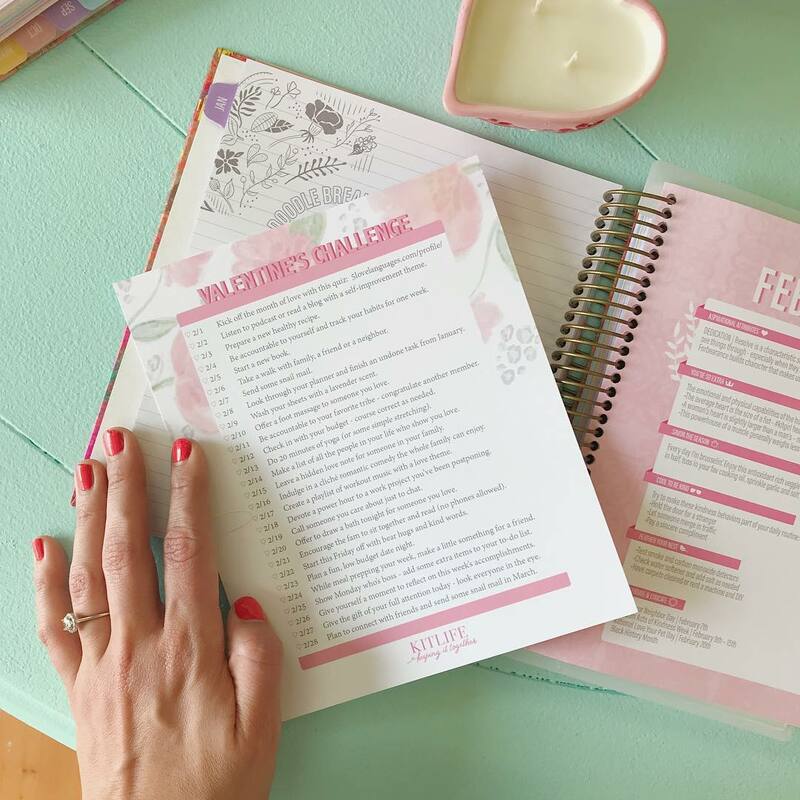 The tasks range from something as simple as taking a quiz, to starting a new book - by the end of this month you'll be feeling accomplished and in the Valentine's Day spirit. ♡ 2/2 Listen to podcast or read a blog with a self-improvement theme. ♡ 2/3 Prepare a new healthy recipe. ♡ 2/4 Be accountable to yourself and track your habits for one week. ♡ 2/5 Start a new book. ♡ 2/6 Take a walk with family, a friend or a neighbor. ♡ 2/7 Send some snail mail. ♡ 2/8 Look through your planner and finish an undone task from January. ♡ 2/9 Wash your sheets with a lavender scent. ♡ 2/10 Offer a foot massage to someone you love. ♡ 2/11 Be accountable to your favorite tribe - congratulate another member. ♡ 2/12 Check in with your budget - course correct as needed. ♡ 2/13 Do 20 minutes of yoga (or some simple stretching). ♡ 2/14 Make a list of all the people in your life who show you love. ♡ 2/15 Leave a hidden love note for someone in your family. ♡ 2/16 Indulge in a cliché romantic comedy the whole family can enjoy. ♡ 2/17 Create a playlist of workout music with a love theme. ♡ 2/18 Devote a power hour to a work project you’ve been postponing. ♡ 2/19 Call someone you care about just to chat. ♡ 2/20 Offer to draw a bath tonight for someone you love. ♡ 2/21 Encourage the fam to sit together and read (no phones allowed). ♡ 2/22 Start this Friday off with bear hugs and kind words. ♡ 2/23 Plan a fun, low budget date night. ♡ 2/24 While meal prepping your week, make a little something for a friend. ♡ 2/25 Show Monday who’s boss - add some extra items to your to-do list. ♡ 2/26 Give yourself a moment to reflect on this week’s accomplishments. ♡ 2/27 Give the gift of your full attention today - look everyone in the eye. ♡ 2/28 Plan to connect with friends and send some snail mail in March.